Why Words Fail in People with Dementia! Do you really understand why words fail while attempting to communicate with individuals with dementia? Learn simple and effective strategies for better communication.This course will expand the knowledge base of professionals working in Assisted Living, Skilled Nursing, Memory Care, Home Care agencies, private practices and related senior centered facilities, on the critical neurology behind language - comprehending, processing and speaking - as it relates to their residents' abilities to understand and communicate. This course will offer information on the neurology behind the developmental acquisition of language in children, and why language fails as the brain deteriorates with most dementias, especially Alzheimer's. Through this course, health care professionals will be instructed in alternative ways to help educate caregivers, both staff and family members, on why certain verbal and non-verbal approaches are effective and preferential, while others are disastrous. User-friendly terminology is provided in this course for all health care professionals to adopt when helping family members and caregivers. Too often great information is lost in translation because the knowledgeable staff members disregard the make up of their audience. This course will delineate varied strategies to help individuals with dementia and Alzheimer's to maintain connections while incorporating the use of the five senses. Each of the five senses-Touch, Hearing, Sight, Smell and Taste-will be detailed as to the chemistry and neurology behind how they trigger and sustain memories. Determine what constitutes genuine language and conversely what is not language as it relates to adults with memory issues. Review the developmental stages of language acquisition in children. Recognize the intricate neurology behind language including Wernicke�s, Broca�s Areas and the Arcuate Fasciculus. Determine potentially overlooked information and unique and/or innovative techniques designed to enhance not only your communication skill set but additionally to share with others in your charge. 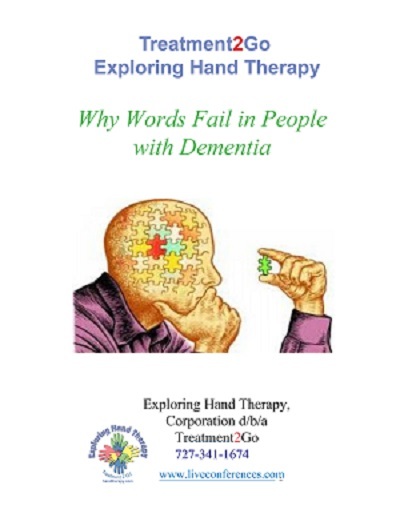 Review why word overuse fails and what people with dementia need to better process what is said to them. Recognize the use of effective non-verbal communication. Determine how each sense facilitates connections with the deeply forgetful in lieu of verbalizing. Using the KISS concept in communication "Keep It Simple Stupid!"